You are most likely a person who likes aviation, flight simulators or games related to the planes. It does not matter whether it is modern jet planes or piston prop airplanes from WWII era or, even, earlier ones. In order to enjoy piloting of your favorite aircraft, it is important to have good flying gear which lasts long and provides accuracy and comfort. That is what VKB would like to bring to the community of flight simulation fans. Where did VKB come from ? Let’s go back to 2003. Few years earlier series of games “Il-2:Sturmovik” got very popular. Many people meet each other in online war and dogfights exploring also a history of WWII. But as soon as more experienced they become, more demand they had. Luckily, it was good selection of joysticks by that time. Even the great Microsoft SideWinder Force Feedback 2 was still on the market. However, it was almost none of rudder pedals available. In fact, it was only one model of CH rudder pedals and that’s it. It had reasonable price and quality for the money but sim pilots wanted something which is made in better quality and much more precise. Interested guys initially discussed their own design and ideas on forums and then decided to join forces and built several prototypes. The result was quite promising and soon the first pedals became available for order. The mechanical design and electronics used were accepted by community with great success. People mentioned durability and accuracy of both mechanical and electronic part. The sensors were quite new in simulator and gaming world. Due to metal design with 14 ball bearings, it provide good quality but from the other side, it made usage of Hall sensors complicated. The sensor for VKB rudder pedals are digital and uses the effect of magnetic resistance, instead of the Hall effect. It is known under trademark MaRS. Why magnetoresistive sensors suits flight simulator gear much better than Hall sensors ? I would like to explain more about the difference in the separate article. Stay tuned ! Feedback from simpilots was very useful and the pedals were improved on all aspects. Later, the number of pedals of the second generation (Mk.12-Mk.19) has been produced, which provided toe brakes with digital sensors and better resolution. Their new controller autocalibrates and keep all data in own flash memory. The pedals may be connected to HOTAS Thrustmaster Cougar directly which is important for people who uses the devices with some older flight simulator games. By this time VKB earned good reputation and VKB rudder pedals was mentioned in an article of Russian edition of Popular Mechanic magazine which told readers about a world of flight simulators. Now we have available third generation of pedals (Mk.20-21) with new controller, new look and more options. Pads are available in two variants: full size, which has been a standard option for years, and new half size pad, which allows to keep foot positioned on a floor. Now the resolution of the sensor and controller increased up to 4000 positions which provides additional possibility to limit pedals for shorter movements if needed and still have high accuracy. 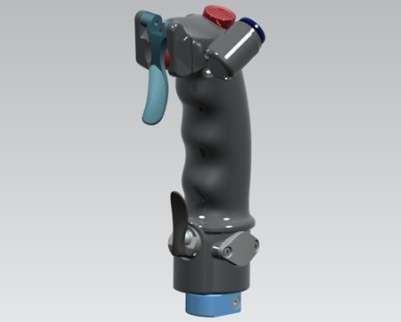 Five years ago, VKB received an order for design and help with production of new mass joystick Defender Cobra M5. After few years of development, new stick, new controller and mechanical design with two separate springs were combined with well-known MaRS™ sensors. This joystick is the best in his class due to perfect magnetic sensors, controller and quality mechanic. The stick itself is designed inspired by a stick from Sukhoi-34 modified for home use. In 2011 Cobra M5 became available in Russia. In 2012 it is available in Europe. At the same time, VKB issued own fully metallic mechanism with no backslash. it uses ball bearings and two springs providing separate load for pitch and roll and they are very easy to replace. Now, demanding simulator pilots may buy Cobra M5 and modified it with kits provided by VKB to the level they want. In the same period VKB engineered several other game devices for a brand “Gametrix” such as racing steering wheels (of course, it based on MaRS ™ sensors which also fits very well for that kind of devices) and vibrating seat which uses force feedback effects. What does VKB mean ? It is abbreviation from Russian “Виртуальное Конструкторское Бюро” and it may be literally translated as Virtual Research and Design Center. That is because the engineers are located in different cities across Belarus and Russia. In current global world it is getting more common ! And now we would like to offer our products or products designed or engineered by VKB in Europe. More articles will come soon ! VKB rudder pedals Mk.21-3 is available for order.